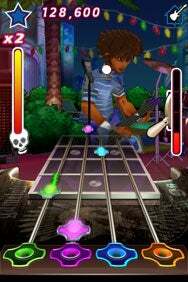 Guitar Rock Tour isn’t the first rhythm music game for the iPhone, or even the most popular (that acclaim goes to Tap Tap Revenge), but it is the closest to an authentic Guitar Hero-style game you’ll find on the iPhone. It lets you play drums, too. Jukebox Hero: Anyone who’s ever played Guitar Hero will instantly recognize how to play Guitar Rock Tour. Made by Gameloft, Guitar Rock Tour follows the rhythm music game play method made familiar by Guitar Hero and Rock Band. Music plays, notes appear on the screen, and you have to hit them in time. The songs included with Guitar Rock Tour are covers of popular rock-and-roll tunes spanning the last few decades—everything from The Killers’ “Walk Idiot Walk” to “Smoke on the Water,” as made famous by Deep Purple. Just like in Guitar Hero, there’s a career-style “tour” mode that puts you in an up-and-coming band, making its way through various venues spanning the world. As you play each gig successfully, you’ll unlock new songs which you can also play individually in a quick mode. There are three difficulty levels—easy has you picking out individual notes, while medium and hard introduce more notes, chords and faster speed. Each requires you to hold the iPhone or iPod touch a different way to get the right grip; all three will tire your fingers and hands out pretty quickly. It takes a lot of dexterity to get the balance right. The actual mechanics of the game are startlingly similar to Rock Band and Guitar Hero—if you miss a note, your guitar will make a sour note, the playing of the song will be disrupted, and the crowd will turn against you. Drop enough notes and your gig will be cancelled all together. These game play elements mercilessly imitate Rock Band and Guitar Hero, but they also make Guitar Rock Tour distinctly different from Tap Tap Revenge, which doesn’t disrupt music playback at all if you miss a note. Personally, I find this style of play more compelling and more challenging, because the audio feedback of hitting the note right—including sustained notes—adds to the challenge, and makes you feel more in control of what’s happening on the screen. Do well and you’ll be awarded with point multiplier bonuses. You can also build “pyro power” by hitting series of notes that look like they’re on fire: When your pyro power meter is full, you flip the switch and the crowd goes wild and your points double for the duration. Guitar Rock Tour isn’t all about the guitar, either. There’s also a drum game mode, which has you playing the same songs. Drums are very, very tough to get right; in fact, playing drums was frustrating enough to make me give up after a while, and I know it’s not just me, because others who I’ve played the game with voiced the same complaint. I think Gameloft needs to rework this somehow in future installments of this game to make it a little more forgiving, especially on easy mode. The more successful you are, the more awards and rewards you’re given—gold stars for good work, essentially. Near as I can tell, there isn’t any “unlockable” content like new guitars or costumes, as there is in Guitar Hero, for example; you have to play gigs successfully in order to unlock all the songs included with the game, though. One of the big hooks that Tap Tap Revenge offers—besides its free price tag—is access to additional downloadable songs (in Tap Tap Revenge’s case, for free, just like the game). Downloadable songs have also been a huge draw for the console versions of Rock Band and Guitar Hero, which charge users money for additional tracks. But what you see is what you get with Guitar Rock Tour. I’d love to see downloadable content made available for this game. As unoriginal in concept and as mercilessly imitative as Guitar Rock Tour is, I find the game to be really well-executed and lots of fun to play. It’s certainly worth the price, and one of the best music games to make it to the iPhone so far. Guitar Rock Tour is compatible with any iPhone or iPod touch running the iPhone 2.x software update.